SMU News, Mar. 29 On March 29, the School of Chemistry and Environmental Protection Engineering invited Professor Peter J.Stang, an internationally renowned chemists, winners of the 2011 U.S. 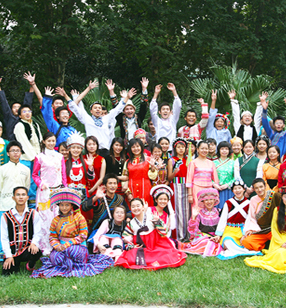 Highest Scientific Achievement Award and people's Republic of China Prize for International Cooperation in Science and Technology in 2015, as well as academicians of the American Academy of Sciences, a foreign academician of the Chinese Academy of Sciences, an outstanding professor at the University of Utah, and editor-in-chief of the American Society of Chemistry, an international top academic journal of chemistry, to come to our School of Chemical Environment. 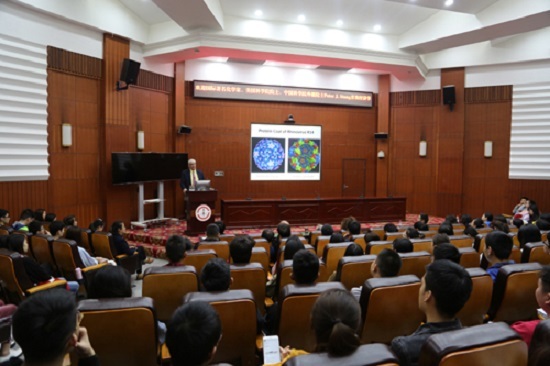 He brought a lecture to the faculty and students, entitled "Abiological Self-Assembly: Predesigned Metallacycles and MetallacagesviaCoordination", in which more than 200 faculty, graduate students and undergraduate students listened to Professor Stang's academic presentation. 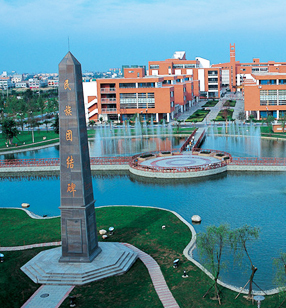 This academic report was presided over by Professor Zhao Zhigang of the School of Chemical Environment. 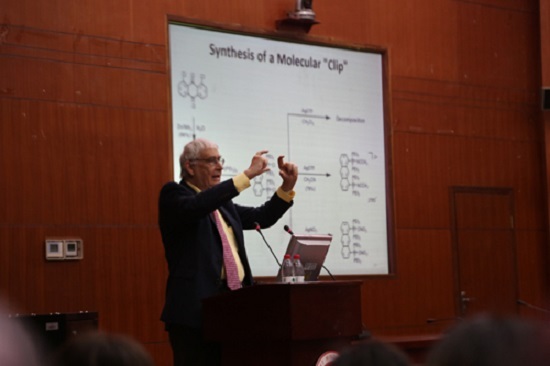 Professor Peter J.Stang shared with teachers and students the achievements and progress in the field of metal supra molecular self-loading more than 20 years. He first introduced the multi-component self-assembly of beer yeast protease from the biological world and put forward the original academic idea that he tried to challenge the multi-component and highly selective self-assembly of biology in vitro. Then Professor Stang introduced how to utilize the non-covalent interaction between transition metals and ligands from many aspects according to the different one-dimensional, two-dimensional, three-dimensional spatial configurations of supra molecular, working on the selective construction of a single supra molecular compound from a number of possible supra molecules. At the same time, he explained how to design and modify the known supra molecular and construct the new polyhedral supra molecular on the basis of the existing work. Finally, Professor Stang also briefly introduced the applications of self-assembled supra molecules in molecular recognition, metal supra molecular dendrimers and so on. Professor Stang's witty language and hyperbole body movements won the laughter and applause of the audience from time to time. 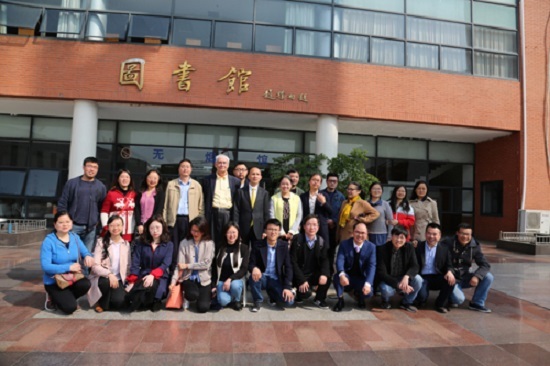 In the report, Professor Stang also expressed his friendly feelings for the Chinese people and his strong interest in Chinese culture, and send sincere blessing to the national teachers and students of SMU. After the report, the school's young teachers, in combination with their own research interests, had a discussion and exchange with Professor Stang. This report has won the approval of the whole school's teachers and students, who believe that this high-level academic exchange is very rare, which can not only enhance the popularity and influence of the school, but also improve the academic level of the school's teachers and students, and promote the scientific research atmosphere of the school. It actively responded to SMU’s call to build a first-class university and scientific research to promote academic development. Some undergraduate students say that close contact and edification with the world's leading academic masters has stimulated their interest in learning, broadened their horizons and provided useful guidance for their future development and learning.